Yes, you can fix your laptop! Fixing a laptop isn't nearly as scary as you might think. Here's what you can hope to do and how to set about doing it. 3 What can you do? Most traditional "clamshell" laptops are relatively straightforward to disassemble and repair. Although they don't contain as many standard parts as a desktop computer, most parts can be replaced and some can be upgraded. If you decide a laptop is beyond repair there may still be the possibility of reusing a few of the components. Unfortunately, newer ultra-thin laptops offer less scope, and a few are virtually unrepairable. Backup important data before you start. Things don't often go badly wrong, but why take the risk? Before starting work, disconnect the power and remove a user-replaceable battery if there is one. Consider whether you need to take antistatic precautions. Brushes and vacuum cleaners can create static. For any but the most basic tasks, the first thing to do is to search for an online repair or disassembly guide or video. One of the best places to look is iFixit.com but a search engine will give others. Many laptops come in several variants so if you can't find your precise model then look through the guides for the closest match and it should give you a very good idea how to proceed. The only tools you will normally need are a set of small screwdrivers and a prying tool - a thin-bladed tool for prying open the clips which very often hold the case together. The iFixit Jimmy is ideal. A knife, preferably with a thin blade and a round end and not too sharp will do if you have nothing else. For the intermediate level tasks you will also need a means of organising the screws. Pill boxes are an excellent choice but egg boxes will do. Be sure to record for each pill box or egg box compartment which disassembly step the screws came from. You think you'll remember, but believe me, you won't! Another good solution is to stick the screws to a sheet of paper with Blu-tac. So long as you only use half the sheet you can fold it over in order to keep the screws reasonably safe if you need to put it aside and come back later to complete the job. Write the disassembly step or where the screws came from next to each blob of Blu-tac. On reassembly, if Blu-tac sticks to the screw threads you can remove it by dabbing them on a piece of clean Blu-tac; Blu-tac sticks to Blu-tac better than it sticks to screws. Sometimes you will find arrows against some of the screws on the base of a laptop or on a motherboard. These are the screws to undo; leave any others, at least for the time being. If the laptop case won't come apart, remember, there's always one more screw! If for instance you can ease it apart by a centimetre or two on the left side but only by a few millimetres on the right, the remaining screw is almost certainly close to the right hand side. On reassembly you may sometimes find at a certain step you have more holes than screws to go in them. This will be because the other holes are for screws to hold the case on. If you put screws in those holes now you'll have a problem later. A good disassembly guide will make this clear. Some are glued together and almost impossible to repair whereas with others simply removing the back gives access to the motherboard and main components. Batteries tend not to be user-replaceable but built-in. They are custom assemblies shaped to fit within the laptop case rather than made out of standard cylindrical lithium cells. The keyboard may be built into the case top and the RAM soldered directly to the motherboard making them much harder to replace. The various tasks you can undertake are listed below, grouped roughly according to difficulty for a typical clamshell laptop. That said, what's easy on one laptop can require extensive disassembly on another, or vice versa. Many laptops allow you to remove the battery simply by releasing a couple of catches. Often, one is spring loaded. With newer ultra-thin and convertible laptops you will probably need to remove the case back. Look for an online guide to show you how. Check the vendor's warranty period and returns policy. Check the vendor's reputation and other purchasers' experience on independent review sites such as Trustpilot. Be aware that favourable reviews can be bought. When the battery arrives, check whether you are required to register a warranty for it to be valid, though under consumer law this should not be necessary. Batteries for ultra-thin and convertible laptops are harder to replace and may be harder to source. Removing the RAM from a laptop. Upgrading your RAM (main working memory) is probably the easiest upgrade you can do, and at the same time, often one of the most effective. You can usually access the RAM slots simply by removing a service cover on the base. Two clips, one either side, hold each memory module in its slot. On replacement, ensure the memory module is seated as far as it will go in the connector before angling it down to engage the clips. If your laptop has a 32 bit processor or runs a 32 bit version of Windows and has less than 4GB of RAM, then upgrading to 4GB (the maximum it can use) is generally well worth while and relatively inexpensive. Upgrading a 64 bit laptop beyond 4GB may well be worthwhile, particularly if you do graphics, video or audio editing, or commonly have many browser tabs open. Many people put up with a damaged or unreliable keyboard without realising just how cheap and easy it might be to replace. On some laptops the keyboard is additionally held in place by one or more screws which you have to unscrew from the bottom of the case, or hidden under a snap-on bezel between the keyboard and screen. On others, the keyboard is integral with the case top, but still not that hard to remove. Replacement keyboards for most models of laptop are available online for around £20. Make sure you get one for your exact model. Also, make sure you get one with the right national keyboard layout, otherwise you may find some keys in unfamiliar places. Removing a laptop hard disk. Very often you can access the hard disk simply by removing a service cover on the base. On some laptops, particularly consumer grade ones, a first level of disassembly may be required. Replacing a hard disk with a solid state disk is probably the most effective way of injecting new life into an old laptop. But if it's running slowly because of unwanted software, pop-ups or viruses then you should tackle those first. If you are running out of storage space then fitting a larger hard disk is easy. Laptop hard disks are highly standardised in size though they do come in several different heights. If you are fitting one with a higher capacity, check that it's no thicker than the old one. If you're happy to reinstall your operating system on your new disk then that's the easiest way to go. To copy your existing system you will need appropriate disk cloning software. Copying a hard disk to a smaller SSD requires an extra step to shrink the file system. Removing a laptop CD/DVD drive. A faulty CD/DVD drive is easily replaced, or you might wish to replace it with a better one, or a Blu-ray drive. They are all a standard size, but come in a couple of different heights. The CD/DVD drive normally just slides into the laptop shell, but it's retained by a screw at the back, somewhere around the middle of the laptop. Quite often you will be able to remove this screw with no more disassembly than removing the service cover on the bottom. The drive will usually have a bezel which is shaped and styled to match the laptop, and this can be unclipped and transferred to a new drive. Removing a laptop WiFi adapter. WiFi is supposed to be standardised, but nevertheless a particular brand of adapter will sometimes refuse to work reliably with a particular router. The WiFi adapter is often a small easily replaceable board. It may be very easily accessible along with the RAM and the hard disk under a service cover on the bottom of the case. Gently lift off the two antenna connectors and remove one or two screws holding it in place, then remove the adapter from the socket it fits in, which similar to a RAM socket but smaller. On some laptops the WiFi adapter may not be quite so easily accessed, requiring a first level of disassembly. After a few years it's very common for the fan (or more usually the cooling fins) to get clogged with matted dust. This will cause the laptop to overheat, the fan to run continuously and perhaps noisily, and may cause the laptop to crash. Cleaning the fan is not difficult but usually requires fairly extensive disassembly of the laptop, which may be daunting. Don't be put off. Given a good disassembly guide, this is perfectly doable. A damaged power connector which no longer connects reliably is not uncommon. In many cases it's replaceable. As with cleaning the fan, this is likely to require fairly extensive disassembly but often, the power connector itself is easily removed from the case and simply plugs into the motherboard via a flying lead. If you're unlucky you may find the power connector is soldered directly to the motherboard, in which case you will need to be confident with a soldering iron to replace it. Or you might find the problem is that the laptop case is broken around the power connector so that you can't push the plug fully home. This battery is usually a non-rechargeable lithium coin cell, or sometimes a rechargeable nickel battery in a plastic sleeve. Either way it may fail after maybe 10 years or more causing the computer to loose its time and date on loss of power. If you're lucky, it will be on a flying lead connected to the motherboard via a miniature plug and socket, or it might be a coin cell in a socket. Otherwise it could be soldered in and a certain level of disassembly may be required to access it. If you can't get hold of an identical replacement, provided it's the same voltage and the same chemistry it should be fine. If you need to improvise at all, make sure you get a "tagged" battery having tags spot-welded to it which you can solder to. It's not possible to solder directly to a battery of any type without damaging it. A broken laptop hinge is a very common problem. Unfortunately it's nearly always the plastic the hinge is attached to that is broken rather than the hinge itself. The hinge screws usually screw into brass bushes set in plastic pillars which are part of the case moulding. These pillars are simply not strong enough in many laptops and break off. Repair can be quite difficult. If you glue the plastic pillar back to the case it has to be positioned very precisely if it's not to be strained when you screw the hinge back to it. If possible, it's best to glue the pillar back to the case, still attached to the hinge, in order to position it accurately. Rapid setting two part epoxy glue is best, and once it's lightly secured, build up more epoxy around the break to reinforce it. If the laptop has been dropped the case may be cracked or broken. A cover or bezel or the clips that retain it may be broken, causing it to keep falling off. This may be challenging to repair properly. The simple, if somewhat inelegant solution is to secure it with sticky tape. Black PVC tape will probably match the case. Gaffer or Duct tape will be stronger. If the strain of the hinge is causing the case to start to crack you can maybe build up a layer of reinforcement across the crack with epoxy glue, or glue a piece of an old circuit board (with the components removed!) across the crack. In addition to epoxy, you may be able to find an inventive way of using thermoplastics for case repairs. A laptop screen can get cracked though physical abuse, or may become faulty, for example showing horizontal or vertical bars across the screen. There are two options: either you can change just the LCD display panel or you can replace the entire laptop lid with a spare, probably taken from a scrap laptop of the same model. Which you choose may depend on availability of spares, ease of disassembly of the laptop, and whether the existing lid itself is damaged and in need of replacement. Replacement of the the entire lid will require a fairly extensive disassembly, but don't be daunted! In addition to the screen data cable there may be another cable for the screen backlight, probably two for the WiFi antennae and another for the webcam, if fitted. Replacing just the LCD panel may be easier. Typically there will be a couple of screws securing the bezel, with adhesive covers hiding their heads for cosmetic purposes. After removing these, the bezel can be unclipped from the shell of the lid using a prying tool. The screws holding the LCD panel in the shell will now be revealed, and removing these allows the panel to be carefully angled forwards enabling you to disconnect the data cable. 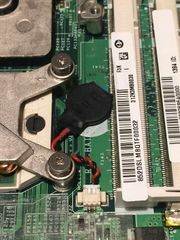 In most traditional clamshell laptops the processor is in a socket rather than soldered to the motherboard, and in principle, can be fairly easily replaced. You might want to do that if you believe that a faulty processor is causing frequent crashes, though it would be hard to make that diagnosis with any level of confidence. You could perhaps fit a slightly faster processor to bring it up to the specification of a more powerful variant of the same model of laptop but it's doubtful whether the effort and expense would be worth the benefit. The heat pipe and cooling grill are permanently attached to the heatsink, and this can be detached from the processor by removing the screws or clips that hold it in place. A lever or quarter-turn screw will then release the processor from its zero insertion force socket. It's critical that all the old heatsink paste is cleaned off and new applied exactly as recommended otherwise the processor is liable to overheat. If you're scrapping a laptop there are several parts that may be worth saving for reuse or repurposing. It may well be worth saving the RAM for use to upgrade another laptop, though the older it is the less likely it is that you will ever find a use for it. Why not pool your RAM with your fellow repairers? This might be worth saving if you are ever faced with a laptop which won't reliably connect to the owner's router. A USB hard disk enclosure. This is probably the easiest. For a modest sum you can obtain a USB enclosure for a hard disk allowing you to use it as an external USB disk for backup or offline storage. Having removed the hard disk from the laptop it will often still be in a laptop-specific carrier. This is removed simply by undoing two screws on each side. The hard disk will now fit directly in the new enclosure. A CD/DVD drive bay enclosure for a hard disk. If you find that these days you hardly ever need a CD/DVD drive and could manage just as well with an external one, you may be able to get a caddy for a hard disk to fit in your CD/DVD drive bay. If you've upgraded your hard disk to an SSD with less capacity then you could use this to house your old hard disk. The heights of the of the drive bay, the caddy to fit it and the hard disk to go in it are the only important things to check. An enclosure for a laptop CD/DVD dive. Similar USB enclosures can be obtained for a CD/DVD drive. The drive will probably have a laptop-specific bezel which can be unclipped and replaced by one that comes with the enclosure. CD/DVD drives often take more current than a USB socket will supply, and so the enclosure may have an extra USB lead to plug into a second USB socket for additional power. If the laptop has a good high resolution screen it may be worth saving. You can obtain a controller for around £20 to turn it into an external monitor for your new laptop or to use with a Raspberry Pi. These controllers are often generic parts which the supplier must configure for your specific screen. The part number should be printed on the back of the screen and it's essential that you obtain a controller for that precise part number, including any suffixes or version numbers, otherwise there's a strong chance it won't work. You can keep the screen in its existing laptop lid or make up a picture frame for it, and maybe laser-cut a box for the controller. This page was last edited on 30 March 2019, at 10:49.